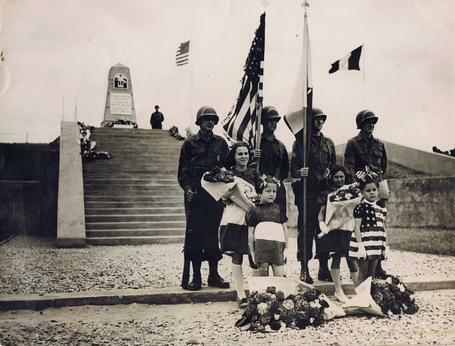 Photo # 1. shows an original U.S signal Corp. photo of the 1st special engineer monument during dedication day June 6th 1945, serviceman of the engineer brigade with their helmets showing the painted curved arc identifying their unit. Young local girls wearing dresses made up from American and French flags, one or both of these dresses can be seen inside the Utah museum. Photo # 2. shows an American family from Georgia, USA, the family live close to the small museum built at Toccoa commemorating the airborne troops that trained there especially E Co 506th ' Band of Brothers '. The museum contains several original wooden stables from Aldbourne, U.K. where they were stationed pre D-Day 1944, http://www.506infantry.org/toccoastables.html. The family kindly agreed to take the positions of the servicemen in the 1944 photo. Photo # 3. shows the original publicity release on the rear of the original 1945 Signal Corp. photograph.